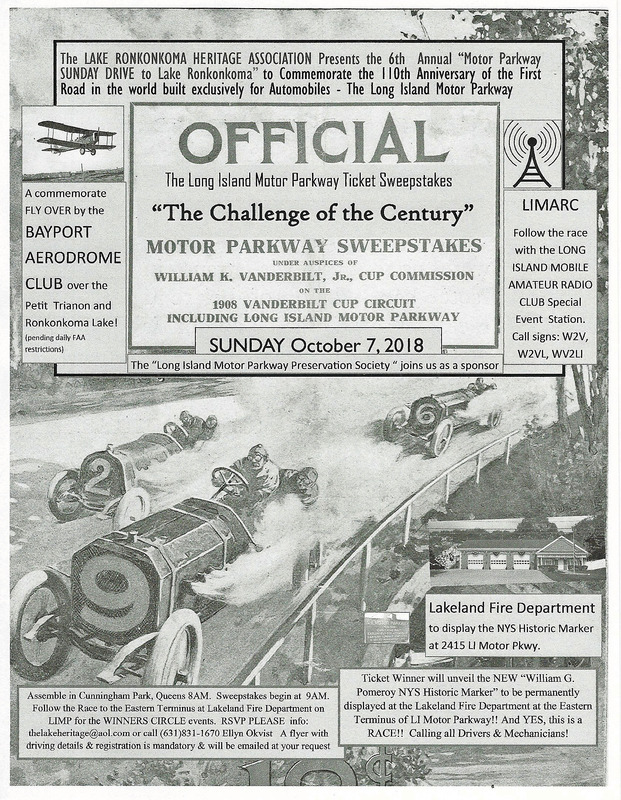 Celebrate the 110th Anniversary of the Long Island Motor Parkway at the 6th Annual Motor Parkway Drive to Lake Ronkonkoma on Sunday, October 7, 2018. For more information & to pre-register contact: the lakeheritage@aol.com or call: Ellyn Okvist @ 631-831-167y, October 7, 2018. This wonderful event is sponsored by the Lake Ronkonkoma Heritage Association. 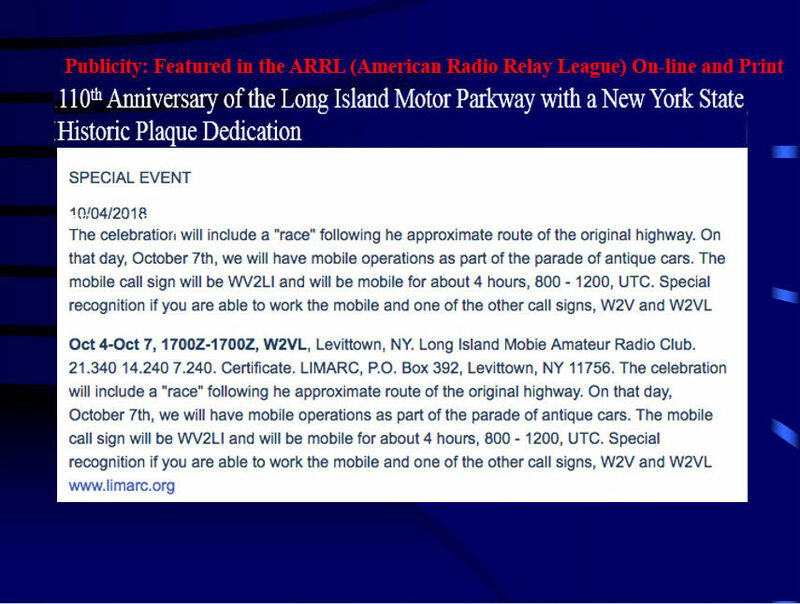 For this special event, the Long Island Mobile Amateur Radio Club (LIMARC) will have mobile operations as part of the parade of vintage automobiles. For more information and to pre-register contact: efokvist@aol.com or call Ellyn Okvist @ 631-831-167. The event is being promoted by LIMARC. My guess is that there’s going to be 1 control center at Lakeland Fire Dept? Will LIMARC have mobile operations established at Lakeland Fire Dept? I don’t own a Classic Auto nor am a Ham Operator, but would like to be a spectator upon the end of the “race” ( Fire Dept ). 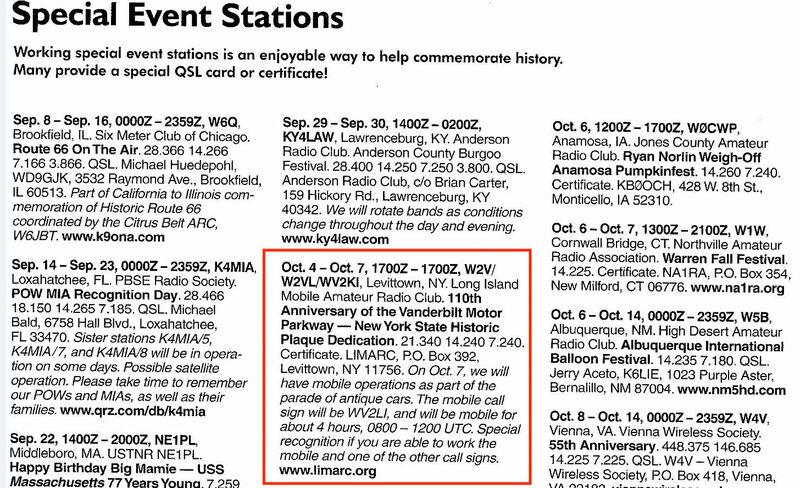 Hi Brian, LIMARC will have a ham radio operator at the firehouse before and while the cars arrive. They will also have a mobile ham station accompanying the “racers”. if it starts at cunningham park will the original pkwy that ends by winchester blvd in alley pond park be used by the cars or bikes,or motorcycles? Paul, yes that’s what we’ve done in the past. I would like to participate in the drive. What are the cut off years for the attending cars? Ed, Tom, All - All cars regardless of age can participate in the drive (antique cars lead the pack, others follow behind). We gather in Cunningham Park around 8pm (Union Turnpike and 196th Place, just west of Francis Lewis Blvd). See you there. 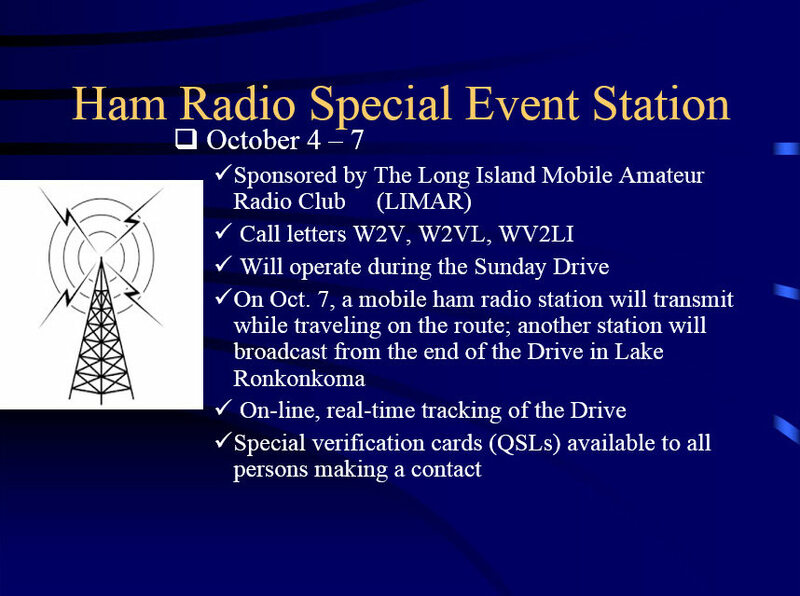 As part of the special event ham radio operation this Sunday commemorating the Motor Parkway’s 110th Anniversary, LIMARC (Long Island Mobile Amateur Radion Cluib) will have a mobile ham radio station in one car participating in the drive, and another car equipped with real-time tracking capabilities. In order to track the vehicle as it makes its way to Ronkonkoma you just need to go to http://www.aprs.fi and search for either W2V-5 or W2V-9. This will bring up the location of the tracking car real-time. These stations are in addition to ones on the air starting Friday, Oct. 5 and one to be located on Oct. 7 at the finish of the drive in Ronkonkoma. My earlier post should have read ” . . . we gather at Cunningham Park around 8AM” NOT 8PM! Meet at Cunningham Park at 8AM! Would be great to see Old 16 and the Black Beast side-by-side towards the lake. Keeping my fingers crossed. My son Christopher and I enjoyed this event entirely! The Ham Operators are true professionals. Couldn’t help but smile upon the classics arrival in Ronkonkoma ( Alco included ). Ellyn Okvist’s words of dedication are a testament to her passion. This was a great time even with the weather issues. I loved seeing the old cars (1908 RR and Model A club cars) and meeting some of the HAMs. Saw some interesting mobile radio tech. Hope someone posts some pictures, maybe he took shots of some of the more modern older cars.